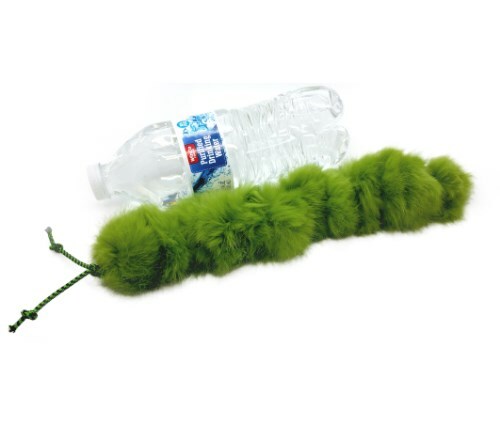 100% Real Rabbit Fur Pom Pom Caterpillar Cat Toy is an oversized fluffy toy that is perfect for the common rabbit kick cats do. They can wrestle, kick and bite these toys or carry around and even sleep with them! Brings out the natural hunting instincts in your feline! Made with 100% Real Rabbit Fur Pom Pom in Bright Green Color. Measures about 12 inches by 2 inches. Made with elastic striped cord for the antenna with an added bell for sound. Cats and kittens love their pom pom toys!